The Canadian couple took the ice one last time and produced a dramatic interpretation of “Moulin Rouge,” flawlessly executing their four-minute program that earned them the gold medal in ice dancing on Tuesday. 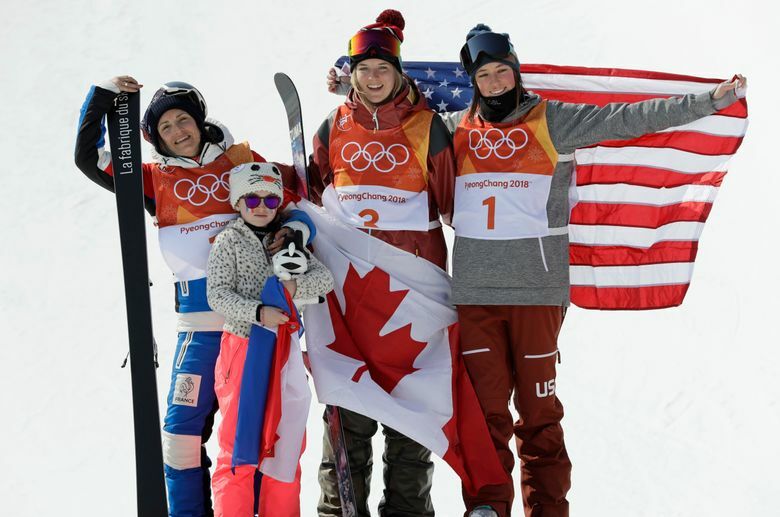 Also Tuesday, the United States men’s hockey team advanced to the quarterfinals with a 5-1 win over Slovakia, and Canadian skier Cassie Sharpe won gold in the women’s freestyle halfpipe. South Korea won a penalty-filled final in the women’s 3,000-meter short-track relay and Martin Fourcade became the first athlete to win three gold medals at the Pyeongchang Olympics when he anchored France to victory in the biathlon mixed relay. Germany swept the Nordic combined Large Hill event podium with Johannes Rydzek winning gold, Fabian Riessle taking silver and Eric Frenzel earning bronze. Virtue and Moir needed their best performance after French training partners Gabriella Papadakis and Guillaume Cizeron broke the world record with a terrific free skate. The Canadians responded with a personal-best 122.40 points and a record 206.07 total, pushing them just past their French rivals’ overall score of 205.28. 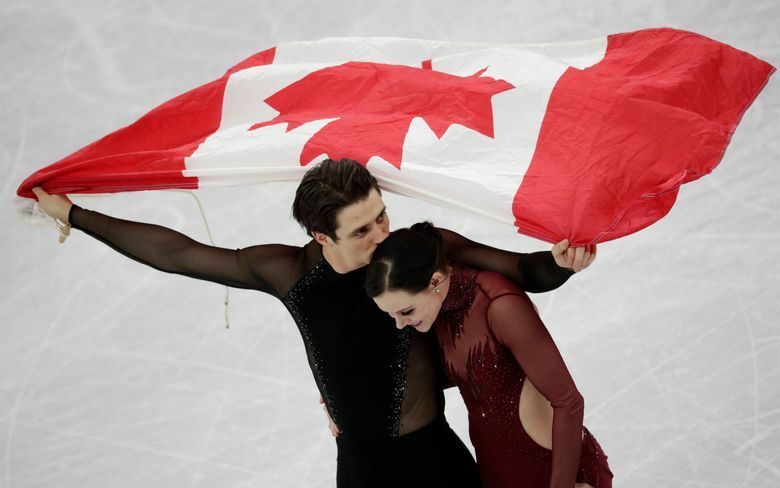 It was a triumphant final Olympics for Virtue and Moir, who also helped Canada win gold in the team event earlier in the Pyeongchang Games. It’s their third gold overall after winning in Vancouver in 2010 and fifth total medal after earning two silvers at the 2014 Sochi Games. Papadakis and Cizeron — who overcame a wardrobe malfunction in the short dance on Monday — earned the silver while American siblings Maia and Alex Shibutani won bronze after a near-flawless free skate to “Paradise” by Coldplay. They jumped just ahead of American teammates Madison Hubbell and Zachary Donahue, who finished fourth. 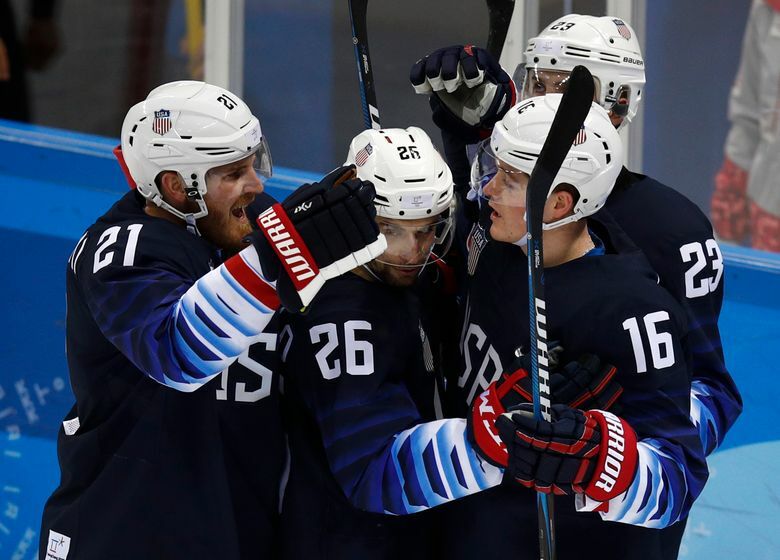 Ryan Donato scored two goals and Troy Terry had three assists to jumpstart the Americans’ offense in their impressive hockey win over Slovakia. 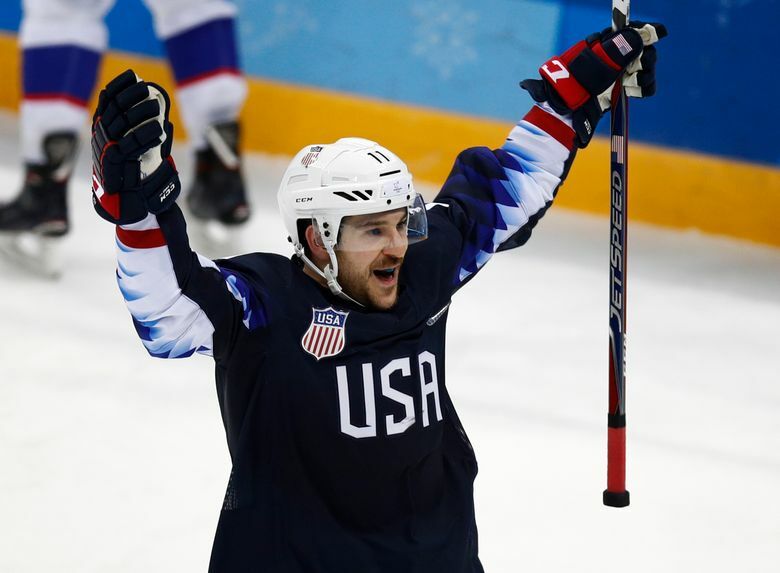 Donato’s two goals helped him tie his father, Ted, with four in a single Olympics. The elder Donato scored four goals in the 1992 Albertville Olympics. Norway beat Slovenia 2-1 in overtime — its first win in Olympic men’s hockey since 1994 — to reach the quarterfinals for the first time. Sharpe posted the top two scores of the day in the women’s freestyle halfpipe, soaring to gold with a pair of thrilling runs . She earned a 95.80 on her second set — highlighted by a 1080-degree spin — that was the highest-ever score in the sport’s brief Olympic history. 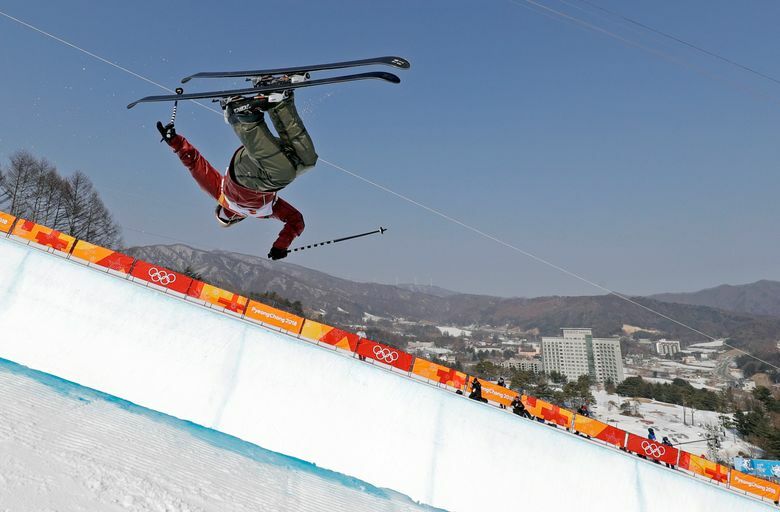 Women’s freestyle halfpipe debuted at the Sochi Games four years ago. It’s the second straight international tournament from which Jeglic has been suspended. He was banned two games at the world championships last year after swinging his skate at a Switzerland player. South Korea won the penalty-filled women’s 3,000-meter short-track relay final while Italy took silver and the Netherlands earned bronze. China and Canada were penalized, meaning Italy moved from bronze to silver and the Netherlands was elevated from the B final, which they won in a world-record time of 4 minutes, 3.471 seconds.